Phweee. Totally buggered today, will make this quick. Aqi's got a new obsession: Katekyo Hitman Reeeeborrrn! <3 5927 FTWWW xDDD Nah I like every pairing lol. I heart everyone. More wallies on the way. Love the single colors and brushes, nice job. You did a cool job on it,I love the small images behind him and the text font...fantastic job,keep it up! "same comment as christabel's one"
Wooww.. AWESOME! You did great job! Keep it up! yay yay Woouaa1! is A very pretty! thegraffitti! are soo fantastic! Nice concept and great vectoring. wow this is awesome, i love how clean the vectors are. hey could you post the other variations? thanks! and where did you find the bigger ones? I love it, all of them together. Oh my god this wallpaper is awesome! 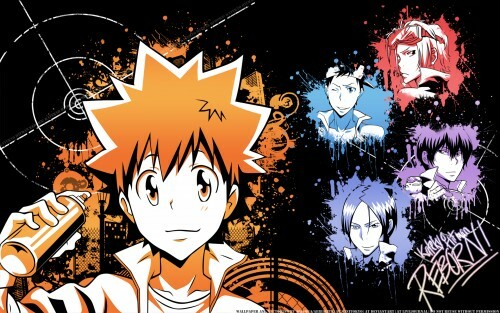 Tsuna and the gang look so Kawaii! i hope you included sasagawa and lambo..
A nice dash of color!